Getting fit to improve your quality of life in retirement? Exercise and fitness has been shown to increase mental alertness and personal happiness as well as physical fitness. The value of exercise for seniors goes well beyond merely a focus on physical health, just as it does for everyone else. The very best exercise for seniors is walking; an hour a day hiking on easy trails, walking with a pet or a companion is one of the best daily exercises available. Seniors interested in this most basic exercise need to develop a walking routine. This may mean a regular daily walk to a restaurant or coffee shop that is far enough away from home. Having a dog is also a great way to create a daily walking routine, of course. Exercise keeps you strong and nimble and helps you avoid falls—one of the biggest causes of the need to move into a retirement or nursing home. It is also shown to have numerous other benefits including maintaining mental acuity, beneficial in fighting viruses as well as boredom and depression, and of course, it maintains or improves self-confidence and personal happiness. Chris Moffett is a specialist in fitness for seniors who has developed numerous exercises specifically for seniors to help them remain active and—most importantly—avoid falls. The following video demonstrates some excellent simple exercises perfectly suited for seniors who want to remain nimble and strong. Walk down a long straight hallway with one hand touching the wall, but walk as if you were walking on a tight rope. Feel the way your ligaments and abdomen tighten slightly as you make shorter steps. Turn and walk down the hallway again, this time keeping your feet closer together, with toes consistently stepping on the ankle of the feet in front as you walk. You can make this even more difficult by walking down the hallway in the same way while turning your head from side to side. This can be tricky at any age as your senses rely on the visual signal. Another way to test your visual signals is to "walk the tightrope" while holding a book. This exercise is demonstrated in the video above. Stand behind a chair, grabbing the back of the chair, with your feet together but not touching. Do ten repetitions of this and you'll feel it in the back of the calf muscles. Now stand on your heels, stretching the arch of the foot, lower back down then repeat this stretch for up to ten repetitions. Resistance training: Simple every day props can be used in resistance training for elderly practitioners. Stability balls are an excellent, relatively inexpensive and fun way to take in some exercise. In the first set of repetitions you are rising and lowering steadily but in the second set you are emphasizing balancing on your heels. Chris outlines many more exercises for the elderly in his collection of exercises to improve balance and avoid falls. Golf, which involves plenty of walking, as well as the exercise of hitting the ball (and walking through the long grass in the rough, looking for your ball). Tai Chi, a low impact exercise regimen. "I never ever thought I’d find myself doing Tai Chi!" says one senior. "I don’t think I’d even heard of it till I came here. But it’s a great thing; it really keeps you loose and gives you some strength." Belly dancing: Greta is one example of the seniors who benefit form belly dancing classes inside the Dunfield retirement home. She was a line dancer in her younger years and in her later years she stays fit by participating in Egyptian belly dancing classes. "Belly dancing," she says, "offer the most complete form of fitness for me and are the most fun I have had working out." 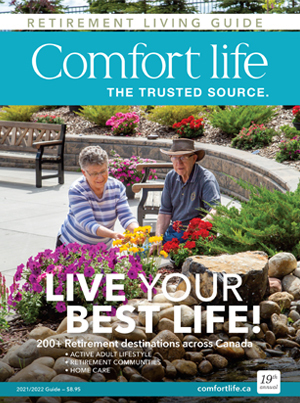 Read about exercise at Dunfield retirement home. Working out is the typical way of exercising and seniors find that this is a great time to socialize. John and Isobel are two seniors at Windsor Court in Fredericton, NB who like to socialize as they exercise together. Says John, "You try to keep yourself young. That’s what it’s all about." Isobel adds, "We laugh a lot together. Laughter’s very important." However seniors exercise, it's a fundamental need to remain active throughout life.